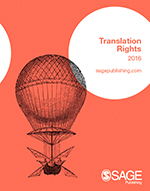 SAGE selects 100 titles every year which are especially popular and well-established for translation into foreign languages. Take a look at our latest recommendations! We’ve partnered with TradeRights to help simplify our subsidiary rights business. Thanks to its market-leading functionality TradeRights provides the ability for rights buyer to search, offer, negotiate and complete deals from the comfort of your desktop. We’ve partnered with the CCC to help simplify our permissions business. Visit Copyright.com to request permission for SAGE books or select the ‘get permissions’ link under an article on SAGE Journals to request permission for a SAGE Journal article.